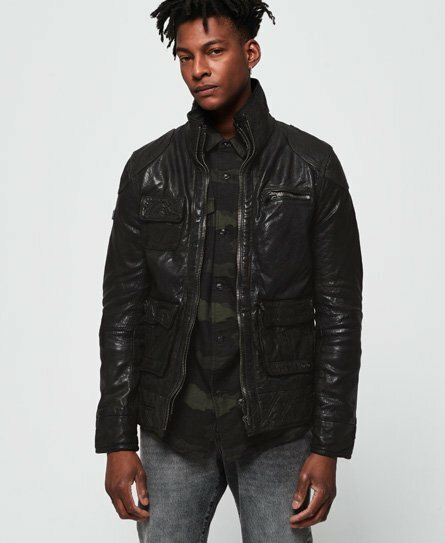 Superdry men's Tarpit leather jacket. Style and comfort have been combined with top quality design to create this luxurious leather jacket. Made from top quality leather, the jacket features a double layer zip fastening, six front pockets to keep your essentials close by and buckle detailing at the waist to add a vintage, antique feel. Inside, the jacket features a quilted lining and chest pocket, the perfect space for your phone or wallet. Completed with a metal Superdry logo badge on one sleeve, the Tarpit leather jacket is a must have investment piece that can be worn for any and every occasion.